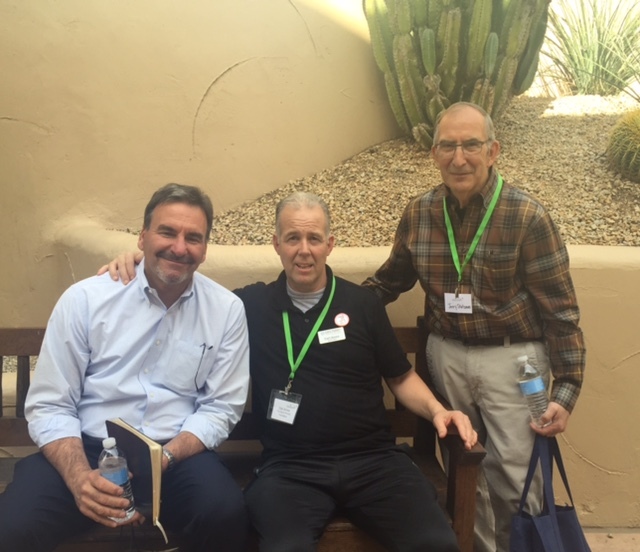 Jim Grossman, Carl Ames and Jerry Stuzman at the Partners in Parkinson’s Event, Jan 30, 2016, Phoenix, AZ. Over 1500 people came out for this event sponsored by the Michael J. Fox Foundation for Parkinson’s Research, AbbVie, Davis Phinney Foundation, and more to share insights, new exciting research and meet others living with PD. Jerry and Carl are two great examples, who, along with Jerry’s sons, have ridden in many cycling events raising funds for PD research. Jim Grossman is a passionate PD advocate whose father had PD and the CEO of Pathways Group, which is dedicated to deploying intelligent software systems that empower patients and their networks of support. The company’s flagship effort is with Barrow Neurological Institute’s Muhammad Ali Parkinson Center.